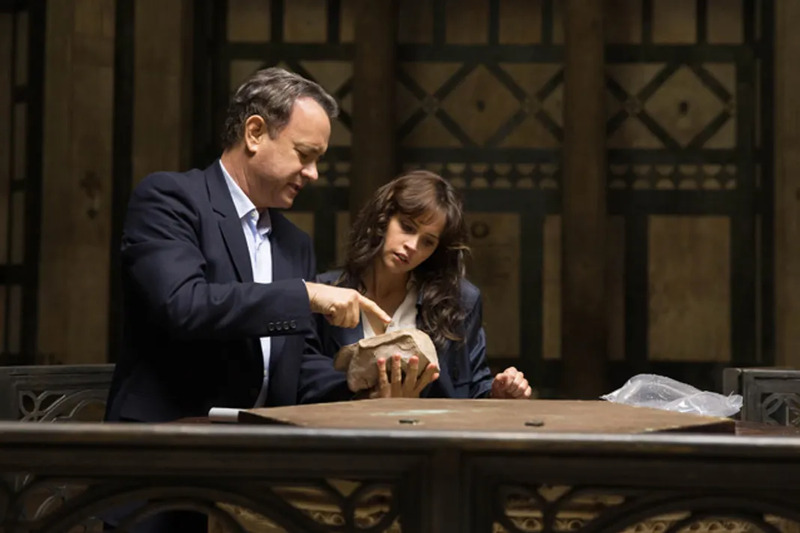 Author Dan Brown‘s Robert Langdon book series has sold over a billion copies, and now the fourth in the series, ‘Inferno’ is coming to the big screen, helmed once again by director Ron Howard and starring Tom Hanks. Back in 2006 is when we first met the film adaptation of The Da Vinci Code. Robert Langdon (Hanks) is a symbologist who was called in to deal with a strange murder. After discovering multiple clues, Langdon unveiled a number of secrets hidden inside Leonardo Da Vinci’s work. In 2009, Langdon found himself in the world of Angels & Demons discovering secrets about the deadly secret society the Illuminati. Now in 2016′ ‘Inferno’, Robert Langdon finds himself in the world of Dante and his inferno. Dante defined the modern conception of hell and it’s up to Robert Langdon to dive into clues left behind from Dante in order to save the world from a deadly plague that will kill everyone. He won’t have to do it alone, he will be with former child genius Sienna (Felicity Jones) and biochemist Bertrand (Ben Foster). Inferno releases October 28, 2016.